Независимый разработчик Хавьер Гутиэрес Каморро (Javier Gutiérrez Chamorro), известный под псевдонимом Guti, представил новую версию своей утилиты FileOptimizer, которая позволяет безболезненно уменьшить размер файлов разного формата. Поведение и функциональность таких файлов остаются без изменений, а размер уменьшается за счет нескольких методик сжатия и оптимизации. Базовый алгоритм использования FileOptimizer предельно прост: вы просто перетаскиваете нужные файлы в окно FileOptimizer, открываете контекстное меню с помощью правой кнопки мыши, а затем выбираете пункт Optimize. После этого будет запущена обработка, а исходные файлы будут перезаписаны их оптимизированными версиями. Можно запускать обработку из командной строки, либо перетащить файлы на исполняемый файл FileOptimizer в окне «Проводника». - Increased NSIS installer dictionary size to 216MB thanks to 4gb_patch by NTCore and upgraded to latest NSIS nightly builds. Size reduced from 96MB to 70MB (maadjordan). - Repacked portable version is now a 7-Zip EXE SFX instead of a ZIP file. Size reduced from 136MB to 66MB. - Updated pingo to 0.89 x86 and x64 versions. - Updated to ECT 0.8.2 (da09899) x86 and x64 daily optimized builds (thanks Malloc Voidstar). - Updated ImageMagick to 7.0.6.3 with HDRI support. - Added EnableCache=false INI setting to enable cache of already optimized files, so they are not reoptimized each time. - Added AllowMultipleInstances=false INI setting, to prevent the warning of multiple FileOptimizer instances running (Jack). - Compiled with latest C++ Builder 10.2 Tokyo April 2017 Hotfix. - Fixed the bug of chineese shortcut text caused by Embarcadero C++ Builder 10.2 Tokyo, issue in the Win64 version when "Link with runtime packages" is set to false. - Improved GUI draw performance. - Improved pingo lossy optimizations for JPEG and PNG. - Improved gifsicle and gifsicle-lossy performance by allowing using more memory, and using several threads. - Added nightly builds at the SVN repository, so they can be publicly tested (Jack, Ryan Morben). - Updated gifsicle to 1.89 (custom build). - Updated pngquant to 2.10.0. - Updated to ECT 0.8.2 x86 and x64 optimized builds (thanks Malloc Voidstar). - Updated Leanify to 0.4.3.192 daily binaries. - Updated SQLite to 3.19.3 x86 and x64 Visual C++ 2017 custom builds. - Updated pingo to 0.88 x86 and x64 versions. - Updated ImageMagick to 7.0.6.1 with HDRI support. - Upgraded distributions to 7-Zip 17.00. - Some minor optimizations and code cleanup. - Addes SQLite database optimization support (necros). - Added ffmpeg to the video toolchain (mp4, mkv, ogv). - New extensions supported in the video toolchain: .mpg .mpeg .flv .wmv .wma .rv .ra .rm .rmvb .ram .smil, qt, mov, 3gg, 3g2. - New extensions added to the ZIP toolchain: .qwk, .ear, .war, .jar, .z01 .z02 .z03 .z04 .z05 .z06 .z07 .z08 .z09 .z10, .zipx, .zx01 .zx02 .zx03 .zx04 .zx05 .zx05 .zx06 .zx07 .zx08 .zx09 .zx10. - Added INI setting MP4CopyMetadata=false to enable copying MP4 metadata. - Fixed some help typos (Joel Rangelle). - Added mp4v2 2.1.0 x86 and x64 static Visual C++ 2017 custom builds. - Added SQLite 3.19.2 x86 and x64 Visual C++ 2017 custom builds. - Added -KeepPhysicalPixelDimensions to PngOptimizer when keep metadata to mantain DPI information (Renard Voß). - Disabled advpng when keep metadata is selected (Renard Voß). - Updated AdvanceCOMP to 2.00 (TPS). - Updated tidy 5.4.0 to be Windows XP compatible. - Updated mkclean to 0.8.9. - Updated UPX to 3.94. - Updated to mp4v2 2.1.0. - Updated mozjpegtran x86 and x64 binaries, because CoolOppo did not build x64 (thanks d4k0). - Updated to ECT 0.7.0 (2b66b21) x86 and x64 optimized builds (thanks Malloc Voidstar). - Updated Leanify to 0.4.3.190 daily binaries. - Updated ImageWorsener to 1.3.2. - Updated ImageMagick 7.0.5.10 with HDRI support. - Updated pingo to 0.83. - Updated strip to 2.27. - Updated to cppcheck 1.79. - Ribbon interface is removed as adviced in FileOptimizer 9.00. - Added detection 7-ZIP SFX archives, since as other SFX data overlay gets stripped after optimization (FatBit). - Updated to C++ Builder 10.2 Tokyo. - Faster and slightly smaller 32 bit version thanks to be migrated to CLang backend (64 bit already was). - Faster 32 and 64 bit versions thanks to new -O3 CLang backend optimizations. - Improved pingo JPEG optimizations. - Updated to pngwolf-zopli 1.1.2. - Updated to mutool 1.11. - Updated to ECT 0.7.0 (9090e23) x86 and x64 optimized builds (thanks Malloc Voidstar). - Updated Guetzli to 1.0.1 (olavrb). - Updated pingo to 0.79p. - Updated ImageMagick 7.0.5.4 with HDRI support. - Updated to cppcheck 1.78. - Added INI setting IncludeMask=. If not empty, only files containing this mask (substring) on name or path will be included from optimization (user202jkl). - Added ECT ZIP support. - Updated custom builds with Visual C++ 2017 (jsmin, gifsicle, jpegoptim). - Updated Ghostscript to 9.21. - Updated Guetzli to 1.0. - Updaded Tidy to 5.4.0. - Updated libwebp to 0.6.0. - Updated pingo to 0.76. - Updated Leanify to 0.4.3.188 daily binaries. - Updated ImageMagick 7.0.5.3 with HDRI support. - Brand new FileOptimizer icon (Thanks Dorel Megaleechers.com). - Added descriptions in INI file to make it easier and safer to be modified. - Migrated from smpdf to cpdf (maadjordan). - Fixed a bug that could show optimized sizes larger than original, when the plugin execution increased it. It was only cosmetic, and optimized size, never was larger (Pepper Andrino). - Ghostrcript is automatically disabled when no downsampling is selected, because it is always downsampling images even if -dDownsampleColorImages=false -dDownsampleGrayImages=false -dDownsampleMonoImages=false are specified (olavrb). - Make sure TempDirectory is created to avoid certain plugins crash (Newtomic). - Patched Guetzli and Mutool plugins to be compatible with Windows XP (thanks Jaff for the patch). - Switched to libwebp without WIC codes to keep Windows XP compatibility (Jaff). - Fixed not properly passing PDF profile to Ghostcript (#9 Runer112). - Updated UPX to 3.93. - Updated libwebp to 0.6.0 RC3. - Updated mozjpeg to 3.2 (Thanks AiZ). - Updated Leanify to 0.4.3.180 daily binaries. - Updated ImageMagick 7.0.4.7 with HDRI support. - Updated pingo to 0.59. - Updated pngquant to 2.8.1 (dado023). - Fixed a regression since FileOptimizer 9.30, that could avoid some plugin optimizations to not being applied (Armin Mueller, signalman). - Fixed a bug when LogLevel was 4, when Optimized Size could be reported as 0 bytes in some situations. - Updated pingo to 0.52c. - Updated ImageMagick 7.0.4.3 with HDRI support. - Added INI setting PDFSkipLayered=false to skip processing of PDF containing layers Optional Content Groups -OCG- (Grahame Bevan). - Implemented using Win64 plugins in all Win64 system, even if you run Win32 version of FileOptimizer. - Added removing metadata in pngquant if PNGCopyMetadata is disabled. - Added Guetzli to the JPEG tool chain when allow lossy compression is enabled (Jyrki Alakuijala). - Added pingo to the JPEG and PNG toolchains when copy metadata is disabled. - Reenabled Leanify in JPEG processing when Copy Metadata is enabled, because now we can use --jpeg-keep-all-metadata. - Fixed crashing with temporary paths longer than 260 characters (Roman Luks). - Updated pingo to 0.52. - Updated libwebp to 0.5.2. - Updated UPX to 3.92. - Updated Leanify to 0.4.3.173 daily binaries. - Updated pngquant to 2.8.0. - Updated to mutool 1.10a with x64 native build (thanks Dirk Paehl). - Updated ImageMagick 7.0.4.2 with HDRI support. - Better performance updating to ASMLib 2.51 with AVX512 support. - Updated to cppcheck 1.77. - Updated to NSIS 3.01. 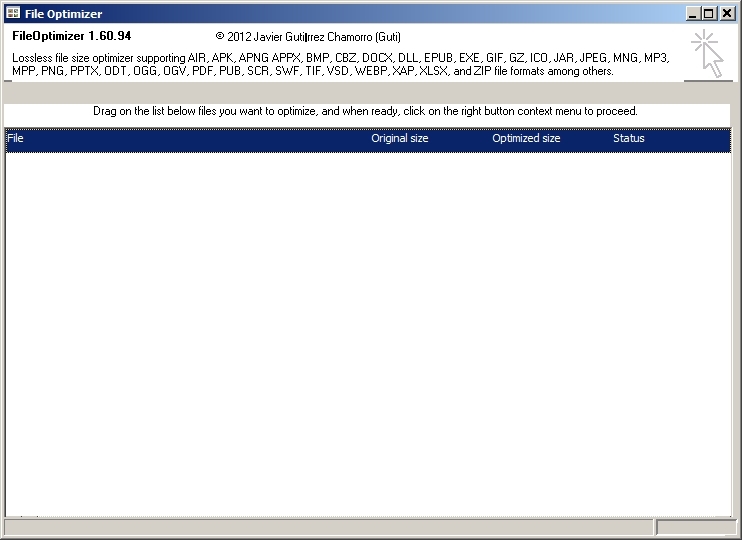 - Installer now supports the /AllUsers argument to install for all users instead of current user (Grahame Bevan). - Fixed remove selected files (Shift-Del) always enabled since 9.00 when unified ribbon and regular UI (TPS). - Added original and optimized sizes in log file (JoeW). - Fixed a bug in mutool that prevented execution on PDF (LeTiger). - Disabled Leanify from the JPEG, PNG and ICO toolchains when copy metadata is enabled, because it removed IPTC information (ZonaCasio). - Updated AdvanceCOMP to 1.23. - Updated to ECT 0.6.2.0 -511fa96- x86 and x64 optimized builds (thanks Malloc Voidstar). - Updated jsmin custom build with Visual C++ 2015. - Updated Leanify to 0.4.3.172 daily binaries. - Updated ImageMagick 7.0.3.7 with HDRI support. - Updated PngOptimizer to 2.5. - Updated Ghostscript to 9.20. - Updated to mutool 1.10RC2. - Better performance updating to ASMLib 2.50 with AVX512 support. - Updated to cppcheck 1.76. - Upgraded distributions to 7-Zip 16.04. - Added INI setting to add extra extensions to be threated as JSON (Oddbrother). - Implemented several UPX compression profiles depending on optimization level (User Hunter). - Updated ImageMagick 7.0.3.1 with HDRI support. - Updated Leanify to 0.4.3.152 daily binaries. - Upgraded distributions to 7-Zip 16.03. FileOptimizer is an advanced file optimizer featuring a lossless (no quality loss) file size reduction that supports: .3G2, .3GG, .3GP, .A, .AAI, .AC, .ACC, .ADP, .AI, .AIR, .APK, .APNG, .APPX, .APR, .ART, .ART, .AVI, .AVS, .BAR, .BMP, .BPG, .BPL, .BSZ, .CBT, .CBZ, .CDR, .CDT, .CHI, .CHM, .CHQ, .CHS, .CHW, .CIN, .CMYK, .CMYKA, .CPL, .CSL, .CSS, .CUR, .DB, .DB, .DCX, .DDS, .DEB, .DES, .DIB, .DLL, .DOC, .DOCM, .DOCX, .DOT, .DOTM, .DOTX, .DPX, .DRV, .DWF, .DWFX, .EAR, .EASM, .EML, .EMLX, .EPDF, .EPDF, .EPRT, .EPUB, .EXE, .FAX, .FAX, .FB2, .FDF, .FITS, .FLA, .FLAC, .FLV, .FPX, .FPX, .FXG, .FXG, .GALLERY, .GALLERYCOLLECTION, .GALLERYITEM, .GIF, .GRAY, .GRS, .GZ, .HDR, .HRZ, .HTM, .HTML, .ICB, .ICL, .ICO, .ICO, .INK, .INLINE, .IPA, .IPK, .IPSW, .ITA, .ITS, .ITZ, .J2C, .J2K, .JAR, .JFI, .JFIF, .JIF, .JNG, .JP2, .JPC, .JPE, .JPEG, .JPG, .JPS, .JPT, .JS, .JSON, .KML, .KMZ, .KMZ, .KSF, .LIB, .LIT, .LUA, .LUAC, .LXF, .LZL, .M4A, .M4B, .M4P, .M4R, .M4V, .MAX, .MBX, .MCE, .MDB, .MDT, .MDZ, .MHT, .MHT, .MHTML, .MHTML, .MIC, .MIF, .MIFF, .MIX, .MIZ, .MK3D, .MKA, .MKS, .MKV, .MMIP, .MNG, .MONO, .MOV, .MP3, .MP4, .MPC, .MPD, .MPEG, .MPG, .MPO, .MPP, .MPP, .MPR, .MPT, .MSC, .MSG, .MSG, .MSI, .MSL, .MSP, .MST, .MSZ, .MTV, .MTW, .MVG, .MVZ, .NAR, .NBK, .NOTEBOOK, .O, .OBJ, .OCX, .ODB, .ODF, .ODG, .ODP, .ODS, .ODT, .OEX, .OGA, .OGG, .OGG, .OGV, .OGX, .OGX, .OLE, .OLE2, .ONE, .OPT, .OSK, .OST, .OTB, .OXPS, .P7, .PALM, .PBM, .PCC, .PCD, .PCDS, .PCL, .PCLS, .PCX, .PDB, .PDF, .PFM, .PFS, .PGM, .PIC, .PICON, .PICT, .PK3, .PNG, .PNM, .PNS, .POTM, .POTX, .PPAM, .PPM, .PPS, .PPSM, .PPSX, .PPT, .PPTM, .PPTX, .PSB, .PSD, .PTIF, .PTIF, .PTIFF, .PTIFF, .PUB, .PUB, .PUZ, .QT, .QWK, .R2SKIN, .RA, .RAM, .RDB, .RFA, .RFG, .RFT, .RGB, .RGBA, .RM, .RMSKIN, .RMVB, .RTE, .RV, .RVT, .S3Z, .SCR, .SGI, .SGML, .SLDASM, .SLDDRW, .SLDM, .SLDPRT, .SLDX, .SMIL, .SOU, .SPL, .SPO, .SQLITE, .SQLITE2, .SQLITE3, .STZ, .SUN, .SVG, .SVGZ, .SWC, .SWF, .SYS, .TAR, .TGA, .TGZ, .THM, .TIF, .TIFF, .UYVY, .VBX, .VCARD, .VCF, .VDA, .VDX, .VICAR, .VIFF, .VLT, .VOB, .VSD, .VSS, .VST, .VST, .VSX, .VTX, .WAL, .WAR, .WBA, .WBMP, .WEBA, .WEBM, .WEBP, .WIZ, .WMA, .WMV, .WMZ, .WPS, .WSZ, .X, .XAP, .XBM, .XHTML, .XHTML, .XL, .XLA, .XLAM, .XLC, .XLM, .XLS, .XLSM, .XLSX, .XLTM, .XLTX, .XLW, .XML, .XML, .XMZ, .XNK, .XPI, .XPM, .XPS, .XSF, .XSL, .XSLT, .XSN, .XWD, .YCBR, .YCBRA, .YUB, .Z01, .Z02, .Z03, .Z04, .Z05, .Z06, .Z07, .Z08, .Z09, .Z10, .ZIP, .ZIPX, .ZX01, .ZX02, .ZX03, .ZX04, .ZX05, .ZX05, .ZX06, .ZX07, .ZX08, .ZX09, .ZX10, STICKYNOTES.SNT, and THUMBS.DB file formats among many others. - Added .webm, .weba and .mk3d support throught MKV tool chain (AlexNG). - Fixed update checker when donor. - Updated pingo to 0.91 x86 and x64 versions. - Updated ImageMagick to 7.0.7.3 with HDRI support. - Expanded Options window to fit all missing INI directives. - Added optional toolbar with menu icons (trlkly). - Added Add folder option (bl3uge). - Added detected filetype under extension column in file list, when its extension is not know. - Accurated file listings. Only supported files will be added to the grid. - Reworked About window to be more colorful. - Added donator information displayed in Information box. You can enter your donator email in Options->Appearance->Donator. - Improved a lot grid performance (listing, sorting, removing, clearing, adding, ...). - Speededup duplicates check when adding items to the grid, which is now exponentially faster (20 times faster for 10,000 files). - Added ImageMagick to the GIF toolchain. - Added ClearWhenComplete=false INI setting to autoclear file list when optimization completes (Lanette Fidrych). - Added TARGA (TGA ICB, VDA, and VST) toolchain, and TGA detection by contents. - Added YUV, YCBCRA, YCBCR, X, UYVY, SUN, SGI, RFG, RGB, RGBA, PTIF, PCL, PCLS, MTV, MVG, MSL, MPR, MPC, MONO, J2C, J2K, INLINE, GRAY, FPX, FAX, EPDF, DPX, DDS, CMYK, CMYKA, CIN, BPG, ART to the ImageMagick toolchain. - Reenabled Embarcadero's Luna, Metropolis and Windows 10 themes removed in FileOptimizer 9.10, because they work fine again with Windows 10 Anniversary and later. Made Windows theme default, because it is stabler and faster. - Fixed themes hidding main user interface when executed via command-line. - Formatted numbers, sizes and times according to locale settings. - Fixed that double-clicking on fixed columns could open selected file. - When multiple instances are allowed, FO will not warn anymore about Optimization still running, nor kill plugin processes. - Made MessageBoxes autoclose after 30 seconds (Devedse). - Rewritten update check to use POST. - Better 7z SFX detection. - Made INI processing safer. - Expanded contextual menu with more new commands. - Reenabled ECT on APNG files (fhanau). - Reduced a bit the quality loss allowed when lossy compression is enabled to improve ratio. - Disabled ECT in MP3 toolchain, because it is not compiled with that module (fhanau). - Fixed version display in About window, and show internal compiler version. - Fixed MPEG recompression when more than one audio stream existed (AlexNG). - Tweaked the Information window. - Added Aero's glass frame to all windows. - Added FLAC codec to the FLAC toolchain to recompress them (AlexNG). - Only use flacout in FileOptimizer compression levels 9, because it is slow (AlexNG). - Removed PCXLite because it contains bugs, and is not needed with ImageMagick. - Better Ghostcript processing (Adventurer). - Removed fix for missing BTHPROPS.CPL and BLUETOOTHAPIS.DLL error on Wine by making them delay loaded on Win32 binaries to overcome C++ Builder XE7 bug, which is solved since C++ Builder 10.0 (trlkly). - Reduced 7z EXE SFX in the portable distribution in 105 KB., becasuse extractor is now UPX'ed. - Updated cpdf to 2.2 patchlevel 1. - Updated mkclean to 0.8.10. - Enabled ImageMagick for JPEG processing when lossy is permitted. - Updated gifsicle to 1.90 (custom build). - Updated to ECT 0.8.2 (a9cb2da) x86 and x64 daily optimized builds (thanks Malloc Voidstar). - Updated ffmpeg to 3.3.3. - Updated SQLite to 3.20.1 x86 and x64 Visual C++ 2017 custom builds. - Updated pngquant to 2.10.1. - Updated ImageMagick to 7.0.7.0 with HDRI support. - Upgraded distributions to 7-Zip 17.01. - Updated to NSIS 3.02.1. - Updated to cppcheck 1.80.